Trend following based absolute momentum is still little known and hardly used by investors. Yet it can be a powerful tool, leading to both enhanced long-run return and especially to reduced risk during bear markets. The more common type of momentum, based on relative strength or cross-sectional momentum, has little or no ability to reduce bear market drawdown. It may even increase volatility and downside risk. 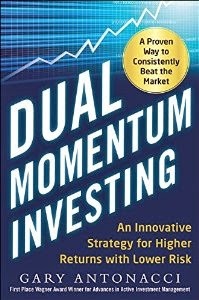 As I show in my book, Dual Momentum Investing, using both absolute and relative momentum together is the best approach in that it lets you enjoy the return enhancing characteristics of both types of momentum while incorporating the risk reducing benefits of absolute momentum. But absolute momentum has possible uses on its own for those who want to limit the potential downside risk and enhance the expected return of single asset or fixed asset portfolio. 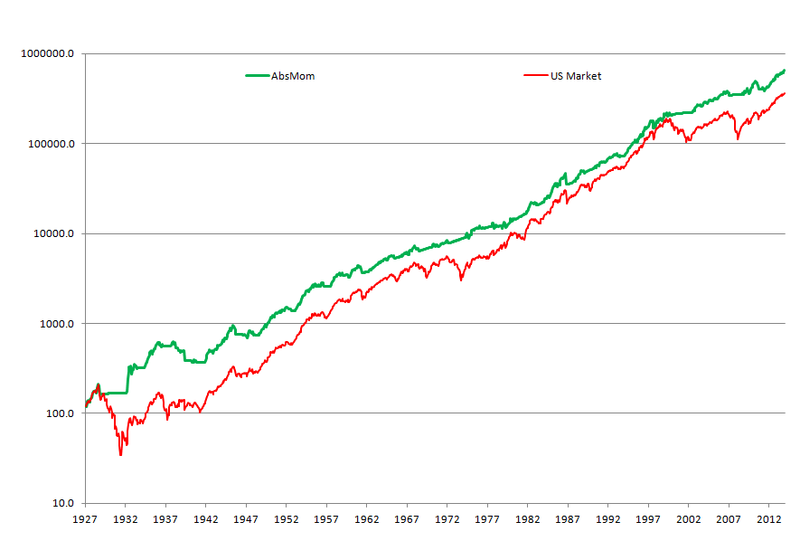 That is why I wrote the paper, “Absolute Momentum: A Simple Rule-Based Strategy and Universal Trend-Following Overlay.” In it, I show how absolute momentum can be applied to manyf different indexes and assets, as well as to some common portfolio configurations, such as balanced stock/bond or simple risk parity portfolios. Absolute momentum is easy to calculate and apply. It is positive if an asset’s excess return (return less the Treasury bill rate) over a specified look back period is positive. One then holds that asset until absolute momentum turns negative. If absolute momentum is negative, then one stands aside. In my research papers, I use data going back to January 1973, since bond index data began at that time and international stock index data began close to it in January 1970. In my book, I also use January 1973 as the start date for my analysis, since my book’s featured Global Equities Momentum (GEM) model relies on the same fixed income and international stock indexes. Those wanting to see more momentum result history can consult the references I give in the book showing attractive profits from relative strength and absolute momentum back to 1801 and 1903, respectively. Yet I now think it would be a good idea now to extend my back testing of absolute momentum, since some investors are especially attracted to absolute momentum for several reasons. First, absolute momentum trades less than dual momentum, which may be important for taxable accounts, even though higher profits are usually earned using dual momentum. Absolute momentum applied to just the U.S. stock market can give mostly long-term capital gains. The second reason absolute momentum may be worth looking at in more depth is that some investors have only a single investment approach that they are comfortable using. They may want to hold a portfolio that focuses on value plus profitability (see my earlier post, “Value Investing Redux”), quality, hedge fund cloning, stock buy backs, dividend appreciation, or other factors. These are hypothetical results and are not an indicator of future results and do not represent returns that any investor actually attained. Please see our Disclaimer page for additional disclosures. Even though absolute momentum may lag behind during prolonged bull markets, we see that it gives attractive long-run results compared to buy and hold on a risk-adjusted basis. 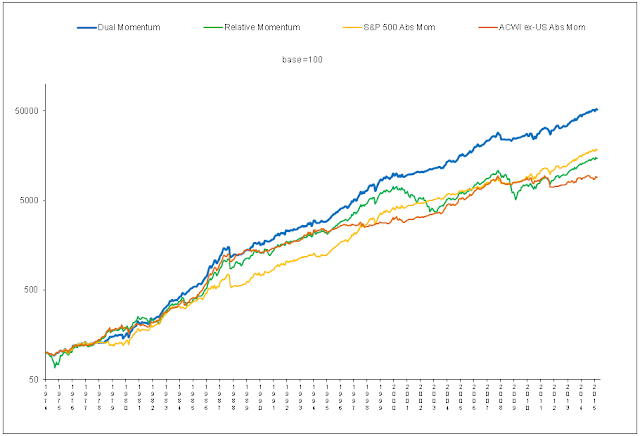 Absolute momentum shows a higher CAGR and Sharpe ratio, reduced volatility, and a better worst drawdown. Dual momentum, which uses both relative and absolute momentum, is still the premier momentum strategy for most investors, but absolute momentum may be a useful tool for some.